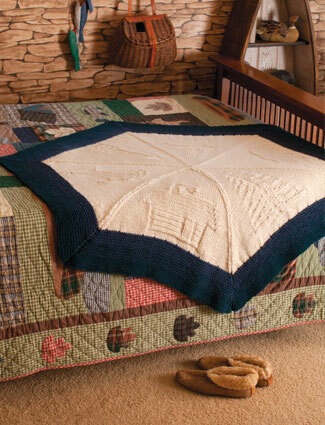 This scrumptiously soft lap throw is inspired by those same gorgeous peaks. Two simple decreases create the mountain-shaped wedges. The ombré border evokes the dusky colors of the mountains, and the subtle tone-on-tone designs created in simple reverse stockinette celebrate the flora, fauna and historic cabins of the Blue Ridge’s Shenandoah National Park.